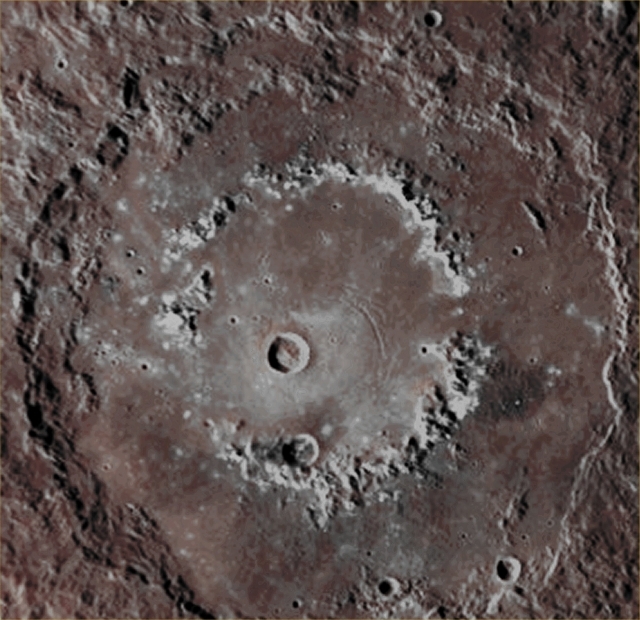 This Absolute Natural Color view (which, actually, it is a crop taken from an image-mosaic made out of three frames) of the Complex Raditladi Crater (approx. 257,7 Km - such as about 160,03 miles - in diameter), obtained by the NASA - MESSENGER Spacecraft on June, 22, 2014, gives us a fresh and really sharp view of this fascinating Peak-Ring Basin. The bright and irregularly-shaped Hollows of Raditladi stand out in white all along and around the Peak-Ring and make, in fact, a quite sharp contrast with tha darker and smooth Crater's Floor. As we alrady wrote in the past, these (relatively) shallow Surface Depressions (---> the Hollows) may result from the sudden loss of Volatile Materials (Ice, among others) that were present in the Sub-Surface (meaning in a place that is very close to the Surface) of many areas of Mercury. This image-mosaic also shows the (faint) darker Ejecta of a Crater that impacted the Raditladi Basin just above its Southern Peak-Ring Structure (see at about 6 o'clock of the Structure). The darker Material was - most likely - excavated (---> unearthed) during the formation of the aforementioned small Impact Crater. This picture (which is a crop taken from an Original NASA - MESSENGER Spacecraft's b/w and Map-Projected image-mosaic published on the NASA - Planetary Photojournal with the ID n. PIA 18629) has been additionally processed, contrast enhanced, Gamma corrected, magnified to aid the visibility of the details and then colorized in Absolute Natural Colors (such as the colors that a human eye would actually perceive if someone were onboard the NASA - MESSENGER Spacecraft and then looked outside, towards the Surface of Mercury), by using an original technique created - and, in time, dramatically improved - by the Lunar Explorer Italia Team. Different colors, as well as different shades of the same color, mean, among other things, the existence of different Elements (Minerals) present on the Surface of Mercury, each having a different Albedo (---> Reflectivity) and Chemical Composition.